Like it or not, the holidays are upon us. Ironically it’s this time of the year when I most appreciate fluffy slippers and recliners but find myself, instead, standing for hours on end in heels. The cocktail party is the culprit. But I love them anyway. I’m brain dead in November and December so I appreciate the lack of conversational depth at these types of get-togethers. 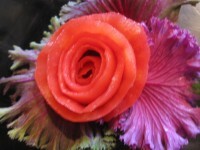 I also love noshing on finger foods, sipping wine and shooting the breeze with folks I haven’t seen for a while. When hosting parties of this nature, I’ve honed my survival skills developed through the years on the line of fire. First, I delegate. I’ve spent years thinking I had to cook everything, especially since I was “in the business”. But those days are over. 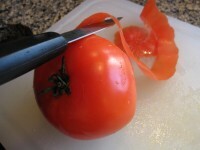 These days if a guest inquires: “Can I bring something?”, and I know they can wield a chef knife, I reply: “Wonderful! We could use….”. But be cautious. Then there are the recipes. Fortunately, two of the most popular appetizers I’ve made happen to be the easiest: Marinated Shrimp and these Beef Tenderloin Canapés. (For tips on purchasing beef tenderloin, read my Cranberry-Zinfandel Fillet Mignon blog.) Unfortunately, they are both pricey, but if time is money and beef or shrimp are on sale, they are worth it. I always select the best tenderloin I can find for these canapés; I find the lower grades of beef tenderloin are not as tender and flavorful. There is no shame in buying frozen appetizers or ready-mades from a favorite deli. I love Trader Joe’s frozen Spinach and Feta Phyllo appetizers. And many delis have freshly made spreads that are delicious on apple or baguette slices. If you need a salad or reheatable for a pot-luck, Arbor Farm’s has delicious, hand-crafted ready-to-gos. The ultimate would be a side of smoked salmon from Zingerman’s, Monahan’s or Whole Foods. 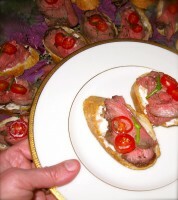 I digress–back to tonight’s Beef Tenderloin Canapes. To slice the beef into neat, thin pieces, I put the cooked tenderloin in the freezer for an hour or two to chill. You’ll get more pieces of meat if you do this. I used an old stand-by, Horseradish Mayonnaise, to spread on the canapés. Another option would be roasted red peppers pureéd then added to the mayonnaise or crumbled gorgonzola added to mayonnaise. Capers, sliced grape tomatoes, green onions and thinly sliced red onions are appropriate accompaniments. 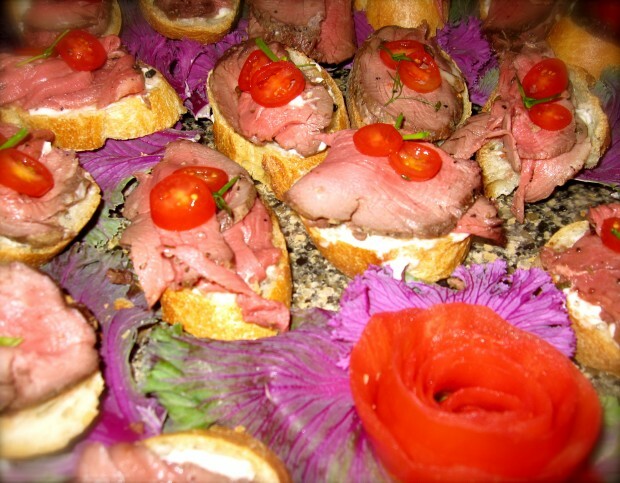 To save time, place the sliced tenderloin next to the baguette slices and let your guests construct their own canapés. Allow beef* to stand at room temperature one hour. Let the tenderloin rest at least 15 minutes or refrigerate, wrapped tightly in plastic wrap, up to 24 hours. 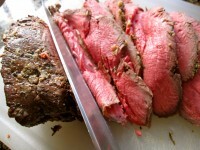 If time allows, place cooked beef in the freezer 1-2 hours, for easier slicing. 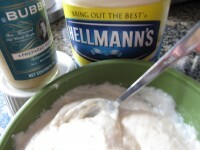 Combine the mayonnaise, 1 tablespoon of the horseradish and the remaining teaspoon of rosemary. Add additional horseradish to taste. Thinly slice the beef. Make canapés or serve with the sauce and baguette slices** on the side. **To save time, have your deli slice the baguettes in advance and keep them in a plastic bag. Make sure the baguettes are baked and sliced the day you intend to use them.